Over the past few years Hoka One One has broadened their spectrum of products rather substantially. Following the original generations of largely oversized road and trail shoes, we started to see shoes designed a bit more sleek and lightweight. Shoes like the Clifton and Clayton headlined their shift to finding a faster shoe. From another perspective, the Vanquish is now their glamour shoe in the premium cushion level in this max cushion brand. 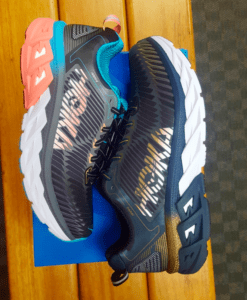 So when Hoka announced their intention to release not one, but TWO true stability shoes, we were thrilled to get our hands on and feet into a pair of the new offerings. One of these models that just released a few days ago is the Hoka One One Arahi, a name which translates to “to lead”. 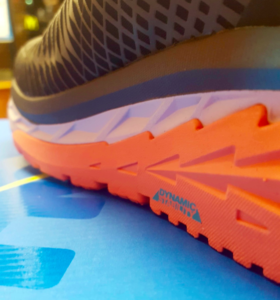 The overall premise of the shoe is to be similar to the Clayton, lightweight and fast, but add a little bit of extra stability on the medial side of the shoe. This extra density of material helps keep someone’s arch a bit more leveled out so they don’t internally rotate. This will help overpronators take a lot of pressure off the arches, ankles and shins. 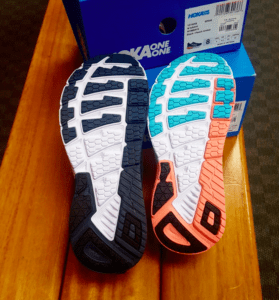 As is characteristic with most Hoka One One shoes, the Arahi is on the stiffer side. This helps also take pressure off tendons in the foot, but is also a byproduct of all the extra cushion put in the shoes! There certainly is lots of plush padding which would make for excellent every day mileage shoe. One trouble some runners have experienced in the past has been shredding of the exposed midsole material in contact with the ground. This is something that had been taken into consideration with the release of this new model in the line. We are seeing a lot more rubber outsole coverage than in other models. This should extend the life of the shoe a bit and prevent premature breaking down of the midsole. We are very excited for this shoe release. The Hoka One One Arahi fills a little bit of a gap in the shoe wall. The response just out of the gate has been excellent, but time will tell what this truly has to offer! The outlook is positive, but come try it for yourself! A few comparable models are the New Balance Vongo, Saucony Guide, Brooks Transcend and Asics Kayano.